With final exam is around the corner, the ART-ivity team from Lap-Chee College is going to present a GPA (Get painting A) workshop. 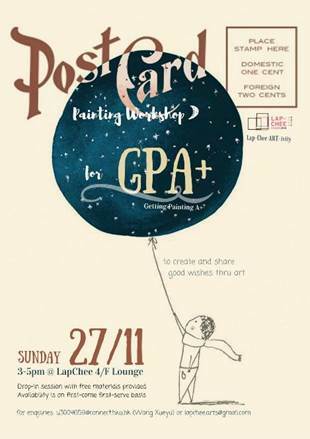 You can paint and write the postcards to deliver your wish of achieving a satisfying GPA. The color blush and blank postcards will be provided for the participants. We will collect and display the postcards for the first week. Afterwards, we will distribute postcards to recipients as written.